What do I do it I lost my pet? Call the Sheriff Department at 608-339-3304 and report your missing pet. The Sheriff Department picks up stray dogs. They bring them here to ACHS. Call 608-339-6700, email or private message on Facebook the Adams County Humane Society with the info about your missing pet. If you can email or private message us a recent picture of your missing pet in Adams County we will post the info and picture on our Facebook page. Please proved a picture if possible, the Animals Name, color, age, if it is spayed or neutered, if it has a collar and what color that is, the closest cross streets to area animal was lost and who to contact. If you the person does not have internet but has a picture of the missing pet they can come into ACHS and we can take a picture of your picture to get it on the internet. Some other great resources are Lost Dogs of Wisconsin and Lost Cats of Wisconsin. Both are on Facebook and will generate a missing pet flier for you and help you share it. Adoptable Pets as well. The more you can get the info and picture out there the better chances you have of finding your pet. What things can I do now to help get my pet home quicker if they become lost in the future? What do I do if I found someone's lost pet? Get a microchip put in your cat or dog. You can get these at any vet clinic and most humane societies. Most humane societies charge $25. Check with your local humane society and vet clinics on price. You can get them year round at either place. We also offer discounted microchips twice a year for $15 at our vaccinations clinics. We hold those every February and July, check the events page for our next clinic. A microchip is about the size of a piece of rice and it goes under the skin on top of the shoulder blade area. We will register your microchip for you, if you go through a vet clinic generally you need to remember to register the microchip yourself so double check with the vet clinic on that. A microchip is not a tracking device but if the pet is found and goes into an animal shelter or vet clinic they will be scanned for a microchip. The facility will then call the microchip company and be able to contact you in about 10 minutes. A microchip also comes in handy when you need to prove ownership. 2) they move or change phone numbers and do not change the info with the microchip company. If a microchip does not have the update information it makes it almost impossible to find the owners. Keep a collar with tags on your pet. 1) Get an embroidered nylon collar with the dogs name and phone number on it (you can order them online). 2) You can buy little pouches that go on the collar and hold all the attached tags together so they do not get ripped off as easily (you can order them online). Do you have a hard time keeping collars on your dog? You can buy a collar on line and in some pet stores called martingale collars, it is a flat collar that they can't back out of. Do not tie a dog up with these collars on. Other ways to keep them safe. Always go out for playtime or potty breaks with your dog. This can help in many ways, help them not be stolen, will help you be able to stop them from eating something they shouldn't, help them not run off and there are many other benefits to this as well. Call the Sheriff Department at 608-339-3304 and report the found animal. The a deputy for the Sheriff Department will pick up any stray dogs, they do not pick up stray cats. Call the Adams County Humane Society at 608-339-6700. We have a lost and found book we can look to see if anyone has reported the animal missing. We can also check the animal for a microchip (any vet clinic or Humane Society can do this for free) if it has one we can call the owner right away. You can bring the dog in to the ACHS if you are able to do this during open hours or call to make an appointment to bring the dog in. If the Animal has a rabies tag you can call the phone number on the tag and they can look up who the animal belongs to. The clinic will need the tag number and year on the tag. The clinic can then contact the owner and connect you with them. If it has a microchip tag you can call the number on that and give them the long number on the tag. The company can then look up the owner and contact them for you. Check with all the neighbors and post flier at local gas stations and businesses. 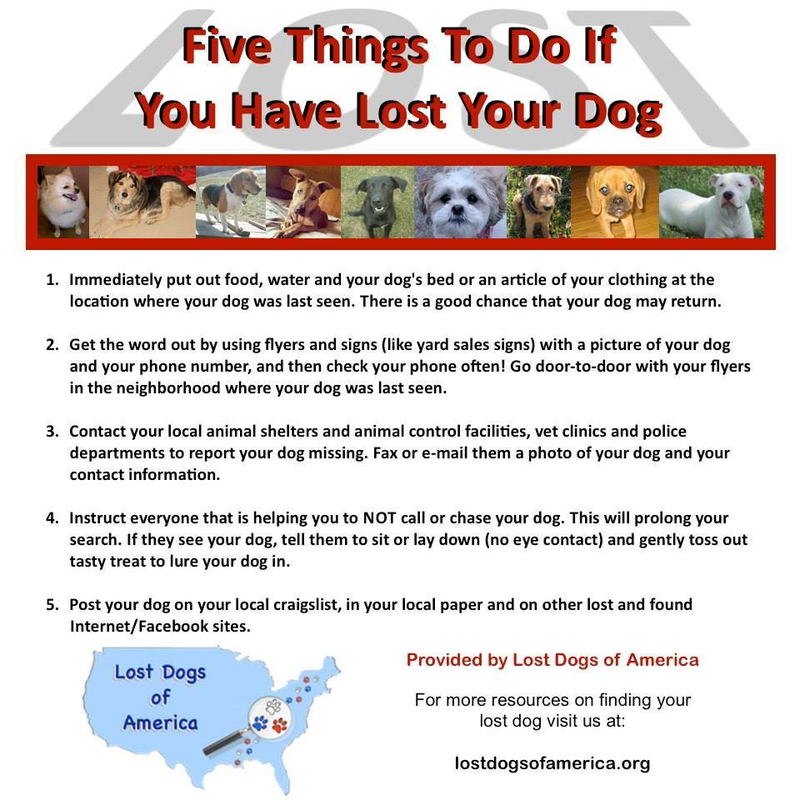 Some other great resources are Lost Dogs of Wisconsin and Lost Cats of Wisconsin. Both are on Facebook and will generate a Found pet flier for you and help you share it. If you find an animal and keep it while you try and locate the owner by law you must make every effort to find the owner for 7 full days (can't count day animal was found) before keeping or giving away the pet.